Mark Reid ('The Inn Way' author & Mountain Leader) and Richard Tarran (Expedition & Mountain Leader) hosted 40 Canadian guests for a week's hill-walking throughout the Yorkshire Dales at the beginning of June. The Canadians had bid for this trip at special gala dinners throughout Canada last autumn to support their Olympic athletes. Accompanying them was well-known Canadian comedian Ron James and 2010 Winter Olympics Men's skeleton Gold Medal winner Jon Montgomery. 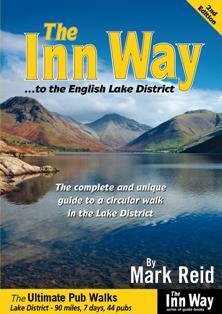 Mark Reid, author of The Inn Way, featured on ITV's The Dales on Monday 6th June. Mark Reid, 'The Inn Way' author and Mountain Leader, met Jackie Stubbs, landlady of the George & Dragon pub at Hudswell, last summer and then took Jackie's mum Margaret for a day's walk from the pub to Richmond and back. We enjoyed lunch sat beside the river beneath the castle ramparts at Richmond, and then walked back along the riverside path through Hudswell Woods before climbing the infamous steps back up to the village! "I stumbled lonely as a cloud"
2-day guided walk with Mark Reid along Stage 1 & 2 of 'The Inn Way' (as featured in the Financial Times). Numbers strictly limited to 12, over 18s only.